I’m alive… and I made two dresses! I am aliiiiiiiive!!! I am so sorry it has literally been about 6 months since I last posted, that is crazy! This past school year was one of the busiest and most stressful ever as I had to complete a teacher intern program (passed thank you JC!!) and had after school commitments just about everyday. Not to mention due to some crazy winter weather we were stuck in school (us teachers that is) until June 12th. I was just too exhausted to even think about sewing! How sad is that? We have also managed to squeeze in quite a bit of traveling during this time to visit my family in New York, a trip west to visit my sister in law, and an incredible traditional Hindu wedding in Nashville. The good news is I am officially on summer break and I am rocking the machine! To start out my summer sewing, I decided that I need to focus on items that are simple and wearable so that they will be really worth my while. I find that my most comfortable and easy to wear items are the ones I gravitate towards most, and I get the most compliments on. While it is fun to try out different patterns, I want to be more smart about what I m investing my time in. I am sure you busy folks can understand! Since I made Sewaholic’s Salt Spring dress last year, I have worn the thing a bajillion times and I just love it! Clearly I needed more of these in my life. Soooo I made two of them! I decided to stop at two, but don’t judge me if more show up. The first Salt spring I made was with a bright Barbie pink linen blend. Yes it is PINK and I love it! I don’t have any pink in my closet and this linen material is so soft and wonderful that it had to happen. It is a bit heavy for a linen so I didn’t want the top to be too billowy or bulky so I took out a lot of the length in the bodice. This pattern has a longer bodice piece than the lining behind it in order to create that billow effect. I just made the bodice piece the same length as the lining. I also opted to made single thick straps instead of the ties because again, I thought it would add too much bulk to the material. 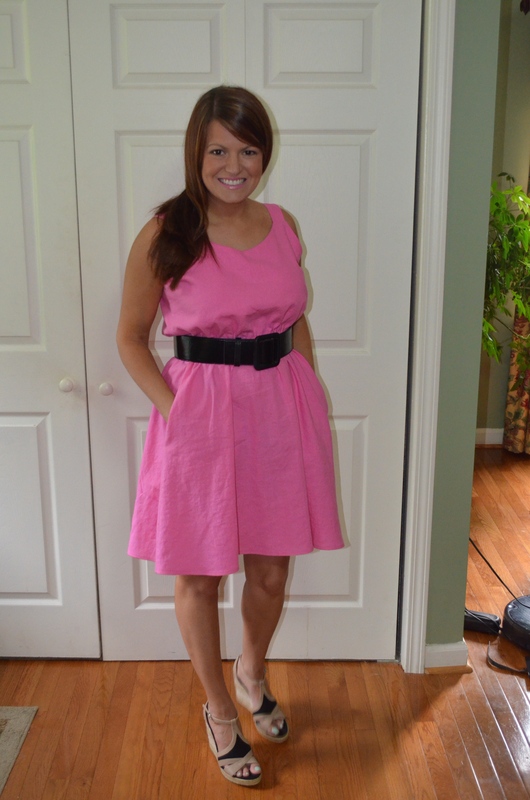 I found that this dress definitely needs a belt to break up the monotony of the solid color. Of course it can use some ironing- it is linen after all. But who doesn’t need a flirty, girly, barbie outfit? C’mon! Hey girl, hey!! The second Salt spring I made is closer to the original version of the pattern. 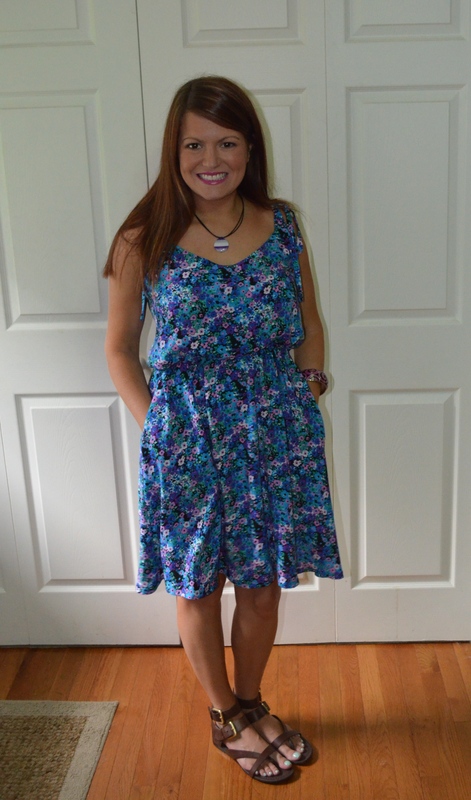 I used this bright floral, flowy, soft, rayon challis. I LOVE this material, it was like wearing pj’s! On this one I wanted to keep some of the billowy effect in the bodice as it agreed with the material much more, however I have a short torso and I didn’t want to be swimming in the fabric. I ended up removing about two inches of length in the bodice and it still was pretty billowy and floppy, but it works! I also opted for the tie straps on this one since the material is so light and unstructured. I wore this dress to a ladies dinner last night and it was a hit! I see this one getting broken out quite a bit this summer. I am loving this throw back 90’s floral trend that is huge right now, that is my decade after all! Before I wrap up for the day, I wanted to share my second goal- buy NO MORE PATTERNS! 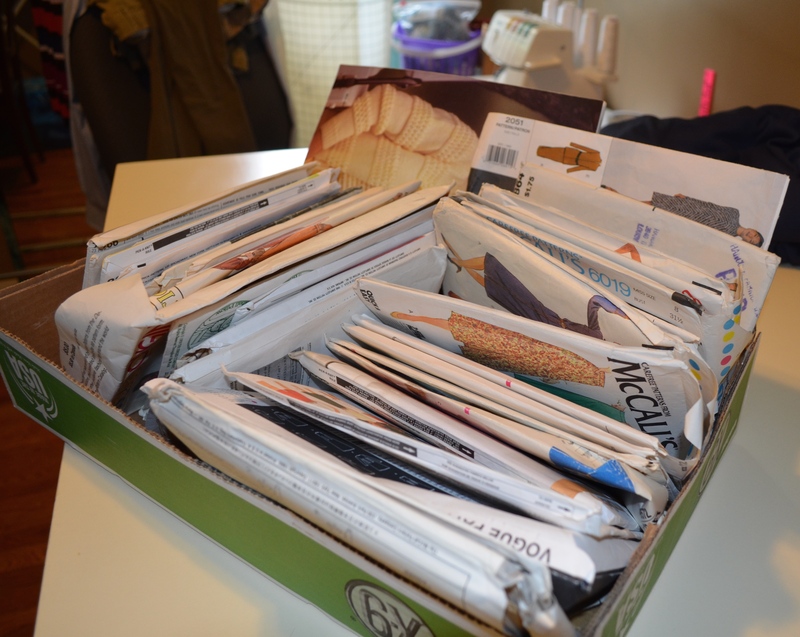 My mother in law recently went to an estate sale and bought two gigantic boxes full of old and new patterns and I went through all of them and took the ones that I liked, which was essentially another box of patterns in my closet. These, plus the huge hoard of patterns I already own need to be loved! So my goal is to try out the patterns that have been waiting sadly forever, and additionally to start remaking items that I love and really work on mastering these. I appreciate a TNT pattern more than anyone, and this need to be a focus! For now I am off, but I will be back soon! Much less than 6 months- whew! Hey cool we have twin Saltspring dresses!! Great minds think alike. I wish I had like, 12 more yards of that floral rayon. Oh I am so glad you posted! You were major inspiration for me & I’m so happy to see you back. Cute dresses! Thank you Karen! I am ecstatic to be back on the train! Thanks girl! I know, I think you are right. Maybe I’ll just make Salt Springs the rest of the summer! Gorgeous! These look great on you- I can see why you made 2! Thanks girl! There may be more! love these! i could have a dozen saltsprings in my wardrobe, such a great pattern! Beautiful! That pink really suits you! Thank you! I’ll do my best to try not to let life get too much in the way! Welcome back! Great dresses and you always have the cutest shoes! So glad to see you back! This is such your style and I must admit the pink is all kinds of rad- totally works for you colour wise. Enjoy your very well earned break!!! Thanks! rayon really is a dream summer fabric. I need more in my life- excited to see your warm weather numbers! Love you dresses as usual, good idea making the linen version less bulky, I wouldn’t have thought of that, it looks great! welcome back, and how! Lovely dresses, that shade of pink is just perfect on you! I really like both dresses but I think the pink is my favorite, it looks great with the black belt and shoes, very cute!